This is the homepage for Barry Deutsch, aka Ampersand. I'm a cartoonist, living in Portland, Oregon. I'm best-known for my graphic novel Hereville, published by Abrams in November of 2010. —Elizabeth Bird, School Library Journal. I also do political cartooning. 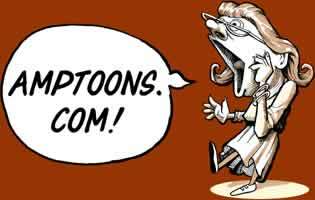 My political cartoons appear in every issue of Dollars and Sense Magazine, and are collected on the website leftycartoons.com. I've done other comics, as well - check out this archive of (some of) my past comics. There's also a portfolio of some of my commerical illustrations. Then there's my blog (mine along with a few co-authors, that is), Alas, a Blog. Lots of discussion of politics here, especially about "identity politics" issues. Oh, and if you're a beginning cartoonist, you may find this Guide to Making Comics I created years ago useful. That's it! Thanks for visiting, and I hope you enjoy my comics.